Way to Go Kevin! 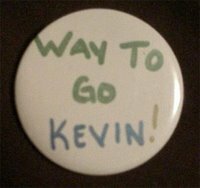 : Way to Go Kevin! "Grandma Jeanette" is a pleasant elderly woman who has lived with my parents for almost two years now and suffers from dementia. She came home from the senior center one day with this incredible button pinned to her cardigan. "Way to Go Kevin!" it congratulated from her lapel. 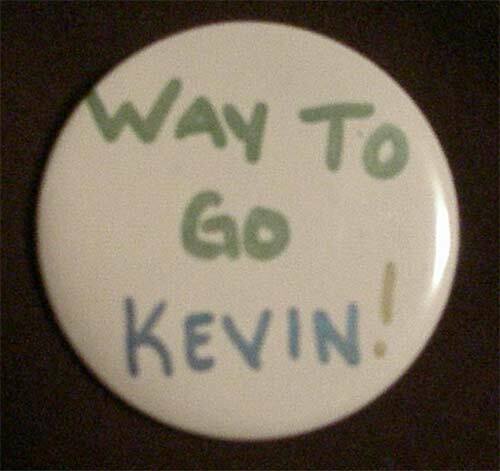 Since none of us (including Jeanette) could remember who Kevin was or anything of his recent accomplishments, the button was placed upon the counter next to the cordless phone. It appeared destined to a life of dusty abandon. But the phrase has refused to die. Something about those words, those sounds, combined to make magic. Maybe it's the mystery. Or versatility. Perhaps just the hearty good cheer. In any case, you'll find that you have a plethora of opportunities to turn this little phrase and that using it might just make your day. Way to Go Kevin! is the Boy Howdy! of late aught six. I know, I know. You say that it can't be done. You say that the resurrection of the catchphrase "Boy Howdy!" in 2002 was a fluke, a mistake, a happy accident. Well that's where you're wrong, brothah. Slogans are all about publicity. And I think we can make this fly! I call upon you, my friends scattered throughout the country (and the world), to give it the old college try. True, you'll get some strange looks from the uninitiated. But just remember, Rome wasn't built in a day and a rolling stone gathers no moss. So get off your high horse and put your nose to the grindstone before it's curtains for you. Now good night, and have a pleasant tomorrow. you are so hilariously random!!!!! In fact, I say way to go Kevin to you for still being alive! I'm giving Kendrick a whu-whuut..AND Kevin. First of all, knitted hedgehogs? unacceptable. Secondy, fantastic post? Stunning. You're using your blog wisely my child.